He talks of the "Scarlet Thread" throughout Scripture. I didn't know it was commonly embraced in evangelical circles today. If you follow my other blog: www.3yearbiblebookclub.blogspot.com, you know I am all about the "Scarlet Thread." I was reading his book while in a row boat fishing at Clear Lake. My friend, Gladwin, grabbed the book and thought it very readable. He is a big theology person. I could be, but I don't want to be. I just want to love God. But this book is a good introduction to theology that emphasizes the relational aspect. 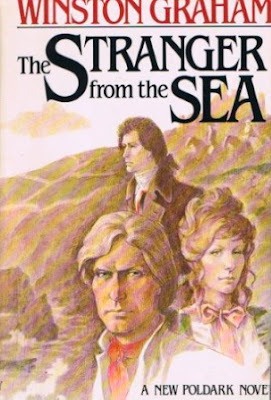 I just had to include this cover of the book because my library has the original hardback version of the the book published in 1981. It amazes me that he wrote the twelve books in the series between 1945 - 2002 with a 20 year hiatus between books 4 & 5! This is book 8/12. Love this cover! :) Love the storyline with more concentration on the next generation of Poldarks/Warleggan, especially Jeremy. The plot thickens. At the end of the Angry Tide, that is the end of the series from the 70's. So, I wasn't super surprised at its ending, but from here on out, the Poldark saga will be new material. (Except there was a movie that we saw with the next generation of Poldarks, but I don't really remember much about it.) The Four Swans had something very different from the old TV version, and it will be interesting to see how the new series handles it! Again, the writing is excellent. My husband and I both intersected on the same novel over our anniversary weekend so I read him the story on the way to the coast and back with our own copies to read in between. We walked about 12 miles on Saturday around Newport, but we managed to get many pages of reading in while we were there.